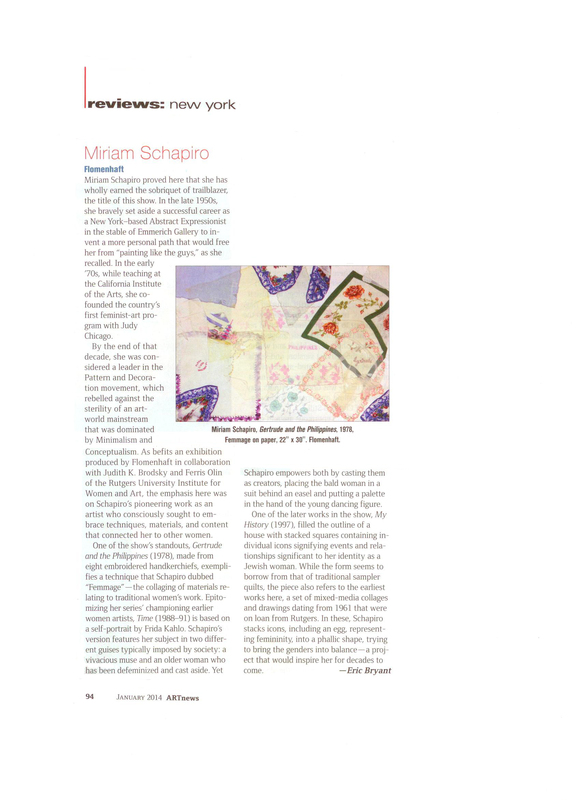 In the 1950s Miriam Schapiro had already been recognized as a successful abstractionist and represented by the Emmerich Gallery in New York. Even so, she felt a sense of inertia by her role as wife and mother. She paused from her painting and embarked on a heroic struggle to find her own identity. Our exhibition begins with her endeavors in the 1960s. She was experimenting with the egg, alluding to women’s fertility and creativity, set in a phallic shaped rectangular container. These works she called ‘Shrines’ as Untitled, Sketch for an Altar Painting (c. 1961). Schapiro was creating a new persona connecting both her feminine and masculine sides. 1970 was a fateful year. She met Judy Chicago in California and together they created the first Feminist Art Program at Cal-Arts entitled Womanhouse. Their goal was to encourage women’s pride in themselves and their creativity as females, also to inspire them to connect with women’s art of the past. Miriam began to layer ‘femmages,’ a term she coined in 1972. 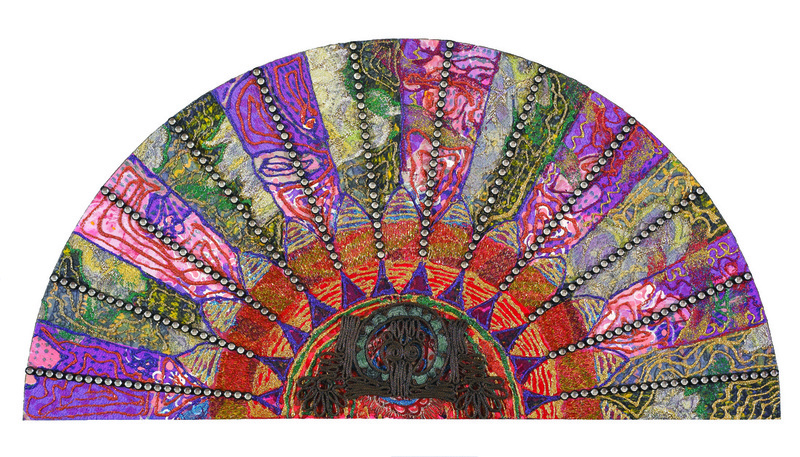 With these boldly distinctive works she altered the shape of art. We are exhibiting a mini-biographical route through Schapiro’s art as summed up in Autobiography (1982). Utilizing quotidian articles from her feminine world she created femmages on which she affixed handkerchiefs, doilies, lace, aprons and more as in Gertrude and the Philllippines (1978). She became known for paintings of objects close to a woman’s daily life, emotions and aspirations such as hearts as in Heart of Hope (1981) and fans like Grandma Bolero (1980). The vivacity she felt in dance was a romantic theme. In Flash and Annie (1992) she was saying, like her movie idols, “here I am.” She played with the Garden of Eden theme as Adam and Eve (1990) and had fun portraying “Punch and Judy” shows as in Punch, Judy and the Demons #2 (1990) and What Baby (1991). ‘Collaborations’ with women artists of the past was an important part of her art. Her greatest kinship was with Frida Kahlo, displayed in Time (1988 - 91), the earliest painting of the Kahlo Series which she called Frida and Me (1990). Time was based on Kahlo’s Self-Portrait with Cropped Hair (1940) painted shortly after her breakup with Diego Rivera. The melancholy older woman in masculine costume seems to have lost status due to the aging process. The younger woman exudes freedom and hope. Schapiro also admired the achievement of Russian avant-garde women artists who the Russian poet Benedikti Livshits referred to as “Amazons.” Exter’s Dancer (1995) in connection with Alexandra Exter relates to this theme. My History (1997) is shaped like the house that is symbolic of many of Miriam’s works. It consists of sixteen compartments each with a fragmented memory of her Jewish heritage. The circle is complete with our last and untitled painting, executed in 2008, that hearkens back to her early abstractions. Our exhibit concludes with personal photos of Miriam, also with her husband Paul Brach, as well as a remarkable selection of her memorabilia loaned by Rutgers University Institute for Women and Art.